Back when I first started podcasting about wine, in late 2004, there were maybe 40 podcasts in the world. But there were even fewer wine blogs and soon I discovered the monthly tasting event called Wine Blogging Wednesday joining on its eighth outing back in early 2005. Over the years I have participated in WBW now 49 times and have hosted 6 times and I am pleased to have it return after a hiatus. The theme I chose for this outing is consistent with the wines I drink this time of year. While I do continue to drink reds, most of the time white or rosé wines are what I choose due to the temperatures outside and the food of the season. And while rosé wines such as white Zinfandel have carved out a significant presence in the market their residual sugar makes them more difficult to pair with food. So I drink exclusively dry rosé in the summer. For the selections made for this month’s WBW I decided to sample what is available under $10 a bottle. After looking at some local stores and big box retailers I settled on a couple of bottles from Trader Joe’s both under $6 a bottle. At this price I wasn’t looking for the best rosé but something that would complement a hamburger or taco. And I wasn’t disappointed. The first bottle is Trader Joe’s Napa Valley Rosé 2012 ($5.99, 13.7% ABV) – It is a light ruby color in the glass with aromas typical of rosé, strawberry, cherry and citrus. There are bright grapefruit and strawberry flavors finishing dry with a touch of bitterness. I found it refreshing but a bit subdued in character but still a decent value. The varieties used were not disclosed but I assume Merlot and Cabernet Sauvignon were most of the blend. 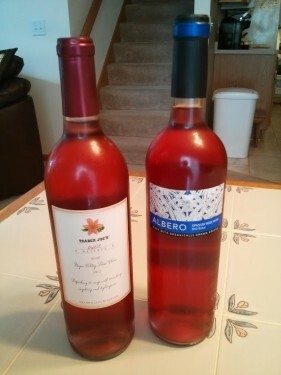 My second selection is from Spain, the Albero Bobal rosé 2012 ($5.99, 12.5% ABV) – Also a nice light ruby color the aromas here are all strawberry and grapefruit. In the glass the wine shows strawberry and lemon flavors finishing dry with nice acidity. A very pleasing rosé made from a grape I have never tried before. A win-win! Both of these wines show how far we have come delivering value even in niches like dry rosé. I’m looking forward to reading what everyone has tried to fill out my cellar for the remaining weeks of summer. You can follow along on my Delicious feed. Thanks also go to Lenn for asking me to host yet again who I will soon pass the baton to for hosting WBW81 next month. Look for a roundup post for WBW80 Friday or Saturday for all the rosé goodness. how’s the round up coming? how’s Lenn’s post about WBW #81 –which takes place this Weds Sept 11?